The problem with supplements: How do you prove they do what they claim to do? 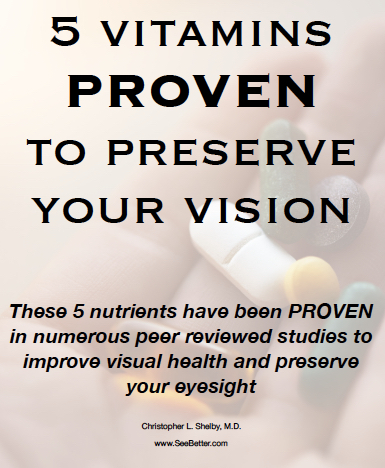 Luckily for vision, there are a number of supplements that have been PROVEN in multiple studies to preserve vision and slow/prevent macular degeneration and also slow cataract development. Vitamin C, also known as ascorbic acid, has long been known to have numerous health benefits especially with immune system support. It is required for the synthesis of collagen, amino acids and certain neurotransmitters. Vitamin C is also a potent antioxidant and helps to regenerate other antioxidants in the body such as Vitamin E. Antioxidants are extremely important because they absorb free radicals. Free radicals are loose electrons that damage cellular DNA and can lead to cancer and other diseases such as macular degeneration. The antioxidant properties and the neurodegenerative effects are thought to be the reason Vitamin C helps with the prevention of macular degeneration. 500mg per day is considered the best daily dosage. At this concentration, 70-90% of it is absorbed. If you take more than 1000mg (1gram) then absorption drops to less than 50%. Vitamin E is another potent antioxidant. It is a fat soluble vitamin which means it is stored for longer times inside the body. When we ingest food fats are oxidized (combined with oxygen to convert into energy). When fats are oxidized free radicals are produced which can lead to cellular damage. Vitamin E stops these free radicals formed when your body converts food into energy. This antioxidant effect is why Vitamin E helps in the prevention and progression of macular degeneration. Because it is fat soluble, you must be careful to not ingest too much or you can build up toxic levels. 400 IU a day is the max dose you should take. Zinc is an essential mineral found throughout the body. It is involved in over 100 cellular/enzymatic functions and has been found to play important roles in immune function, wound healing and DNA synthesis. There are no known stores of zinc so dietary supplement is almost mandatory. Because of its crucial role in DNA synthesis and cellular immunity, it is thought to help prevent damage, along with the other antioxidants, to the retinal cells and prevent macular degeneration. *Because high doses of zinc can affect copper absorption, you MUST take a small amount of copper when taking higher doses of zinc. Lutein is a fat soluble pigment that is found as part of Vitamin A or carotenoid to be precise. It is found in a wide range of fruits and vegetables, kale being the highest. Lutein is found in high concentrations in the retina, specifically the macula. In nature, lutein absorbs certain wavelengths of light to prevent damage from too much light energy. The same holds true to the macula. Lutein absorbs and blocks blue wavelengths of light that are known to damage the macula and lead to macular degeneration. It also holds antioxidant properties that in conjunction with other antioxidants helps prevent cellular damage. Just like lutein, zeaxanthine is a carotenoid fat soluble pigment. It is also found in high concentrations in the macula and is responsible for absorbing harmful blue wavelength light. Zeaxanthine and lutein should be treated as one. If you take lutein you also need zeaxanthine. They have both been shown to act as antioxidants and prevent light induced oxidative damage to retinal tissue.